This may be the year in which sport, especially soccer, emerges as the next frontier in the global Boycott, Divestment, and Sanctions (BDS) campaign to isolate Israel over its occupation of Palestine. And the ball is in BDS’s court, so to speak. Although the PFA motion was narrowly focused on specific Israeli violations rather than the impact of the occupation more broadly, Israel reacted with a full court diplomatic press. Israel launched what Prime Minister Benjamin Netanyahu called an “international effort” to persuade other countries not to back the PFA’s bid if it came to a vote. This reportedly involved lobbying the sports ministers and football association heads of more than 100 countries “in order to draw a line in the sand.” The result was a temporary victory for Israel: a toothless monitoring committee that has predictably made no substantive progress months later. Is New York State About to Create a Blacklist of BDS Supporters? But Palestinian campaigners and their supporters will take courage from the fact that the motion also generated widespread coverage and debate, both beyond the sports world and beyond those who normally pay attention to the Palestine-Israel issue. Israel and its supporters can’t be happy with the growing presence of protesters at matches involving Israeli sportspeople. This includes opposition to Israeli participation at tennis tournaments; protests against the decision by UEFA, the governing body of European soccer, to award Israel hosting rights for the 2013 Under-21 Championship; disruption of ice hockey games in South Africa; protests outside basketball matches in the United States and football games in Europe; and a number of leading, mostly African, soccer players coming out in support of Palestinian rights. Even more concerning to Israel must be analogies to the sports boycott of apartheid South Africa. FIFA was the first major international sports organization to suspend South Africa. The sports boycott forced many people who might not otherwise have done so to reckon with the issue of apartheid. Like South Africa then, a central tenet of Israeli identity is that of an outpost of Western civilization in an otherwise backward region, a nation oriented toward the United States and Europe. While Israel is not dominant in any global sports the way South Africa was in cricket and rugby, a concerted campaign by the BDS movement to promote a sports boycotts has the potential to have a powerful psychological effect by disrupting Israel’s attempts to present itself as a normal nation. Israel’s concern is understandable given the powerful symbolism and potential ripple effects that its suspension from FIFA could have. Few things would bring the conversation about BDS and the Israeli occupation to a wider audience than Israel’s inability to compete in European and international soccer tournaments, or to participate in other arenas such as the Olympic Games. The BDS movement itself is a legacy of the campaign against South Africa. But despite this connection, so far sport has not been a prominent part of the campaign, as Omar Barghouti, one of the leading figures in the BDS movement, has acknowledged. Part of this absence may have to do with how the Palestinian establishment views a sport boycott. The BDS movement was unsurprised at the ongoing reluctance of the Palestinian sports establishment to stand up to Israel. The head of the PFA is Jibril Rajoub, who in one of his previous jobs was chief of the notoriously repressive security forces that collaborate closely with Israel. The effects of the Israeli occupation on Palestinian soccer had been on FIFA’s agenda for the previous two years, and each time Rajoub, a senior member of the Palestinian establishment, had threatened to seek sanctions if things did not improve, only to back down from his demands in the end. Indeed, Israel figured it could rely on Palestinian authorities not to push the issue too far. Prior to the FIFA Congress, a senior official in Israel’s Foreign Ministry predicted Rajoub would “ride this issue to the very last moment and then step back.” Despite this, Israel was still clearly worried about the attention the issue was receiving and the threat of suspension. 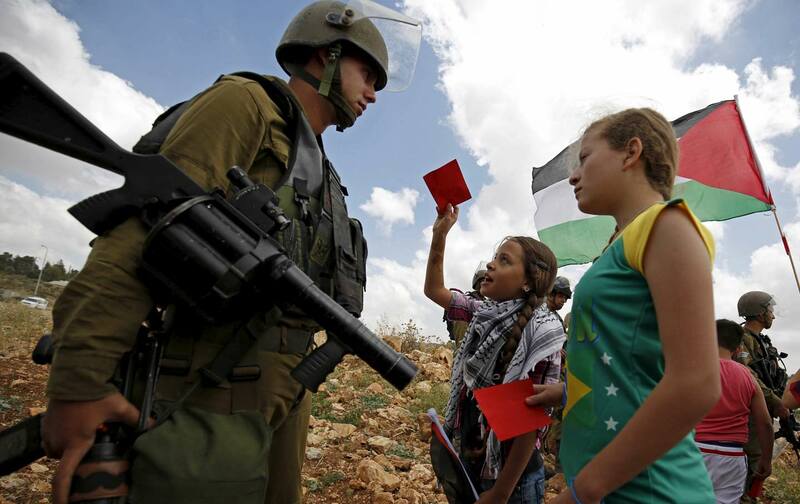 There appears to be support among Palestinians generally for sporting sanctions against Israel. However, to date BDS has largely been focused on other targets. In recent years, the cultural boycott has become a growing aspect of the movement. While the success or failure of cultural boycotts is debatable (they have had success up to a point), what the South African case points to perhaps is the greater impact of sports boycotts on political attitudes and reform. One thing that seems to work well—when international diplomacy and common sense have failed—is the threat of withdrawing a rogue nation from the community of sport. In South Africa the slogan “no normal sport in an abnormal society” encapsulated the conviction that as long as the regime excluded the majority of its people from participating in society as equals, it should be excluded from participating in international sports competitions as equals. For white South Africans (and their apologists), sporting isolation was a bitter pill to swallow. The Israeli government and sports associations’ responses to recent threats of Israeli expulsion from UEFA and FIFA are particularly instructive: Citizens have strong feelings about sport. It is closely tied to national identity, and the symbolic effects of sporting sanctions are more palpable than economic sanctions may be for many citizens (in the way, say, that being denied access to certain commodities may not be). Up to now, BDS has been largely ambivalent about a sports boycott. Nevertheless, experience has shown that sports boycotts are very powerful tools for international solidarity groups. Ultimately, they could prove crucial in the Palestinian case, forcing a much broader conversation about the Israeli occupation and potentially representing one of the most significant threats yet to the status quo. Sean JacobsSean Jacobs is editor of Africa is a Country and co-editor of Apartheid Israel: The Politics of an Analogy (2015). He is on the international affairs faculty at The New School. Aubrey BloomfieldTwitterAubrey Bloomfield is a graduate student at The New School in New York City.